Some things that drove me a little buggy this week. I won’t go into how we found camel crickets in my office, and I am not the type of person who will show pictures of them for shock value, but rest assured they are ugly and the size of a small European automobile. Fortunately, I have both a husband and one child up for the tasks of insect removal and abatement. Beyond that, bugs of a different sort entered our lives recently. Fairies. Whatever spectrum fairies are on, my daughter is right there while I’m light years away. My daughter floats about in whimsy while I practice the darker arts of humor and eating kale for my health. 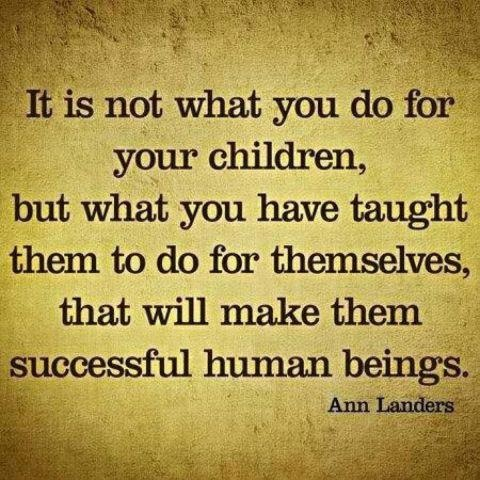 I ran right to my shelf of parenting books and looked in all the tables of contents. Nothing. Not even in What to Expect When Your Chidren Come Home From School and Make Open-Ended Declarations That Give You Ulcers. I was forced to wing it. “What bet was that?” I asked while thinking Please don’t involve poop, underpants, sassing staff, eating scabs, Texas Holdem, or Bitcoin. Are not most deeply-held belief systems easily tossed aside if wagers are lost? Lo and behold, F’s fairy DID respond in some fashion. I’m not exactly sure how. I wasn’t paying very close attention. In my defense, it takes my daughter hours to get to the point of a story. Also, I was focused on choking down some kale. And I thought that was it. You know, cute story. Look, I’m not one who will yuck someone else’s yum. You wanna wear butterfly wings and sparkly shoes and build gauzy forts for tea parties? Go nuts. But this? An ongoing pen-pal relationship where I’m essentially stomping around in a gleaming world of marshmallows and unfettered joy? 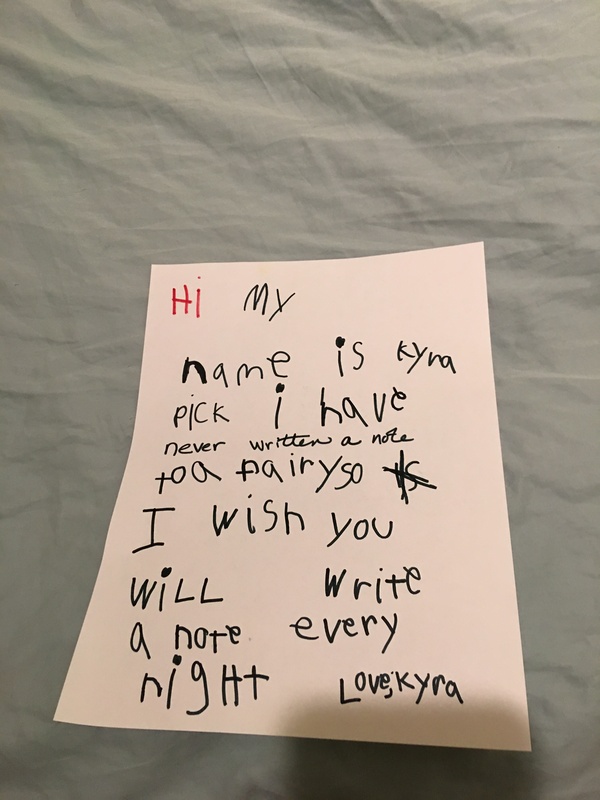 This is like the tooth fairy on steroids – and I’m the parent who, when one of my boys lost his second or third tooth (again, I wasn’t paying close attention), I completely forgot until three seconds before he woke up. I had no cash, so I scribbled “Way to lose a tooth! 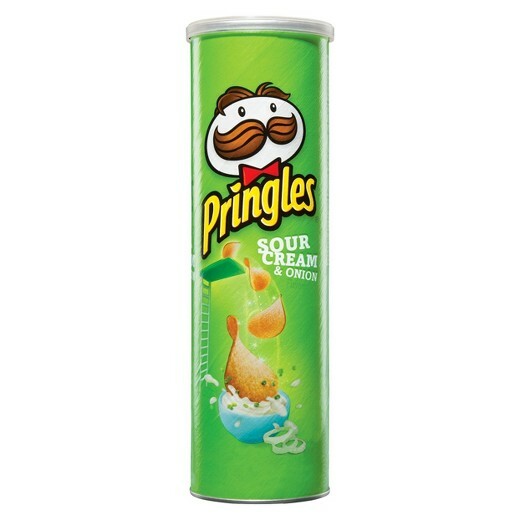 – T.F.” on a Post-it and stuck it on a can of Sour Cream and Onion Pringles, which I put on the kitchen counter because I knew that shoving that under his pillow would completely ruin whatever magic was left in this dismal exchange. This did not bode well for a penpal relationship. I hoped that she would forget. She often does because she is five and fives can lose interest in things. Yesterday, she was pretty mopey in the morning, which is unlike her. “Did you leave her a note?” I asked. 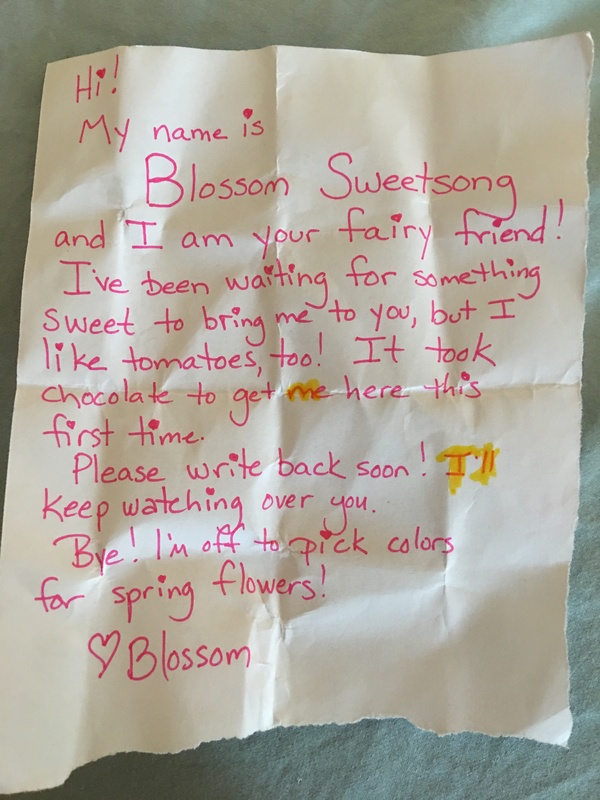 Inside was a cherry tomato. “She didn’t take the tomato!” My daughter was as dismayed as one can be. Parenting achievement level: Three’s Company. So my daughter unwrapped a mini-Snickers – ok, where did that come from? – and put it in the box/portal to the fairy world. Like any fair-to-middling mother, I ate the chocolate after she went to school and wrote back, grateful that she has not yet figured out how to do handwriting comparisons. Not sure what the yellow blobs are there – I’m guessing she was doing some CSI-level work on this. She was thrilled and wrote back immediately. Can you guess which line she asked me to write because she was eating cherry tomatoes and didn’t want to mess up the paper.? I’m afraid this will continue for a while. Wish me luck in this strange new territory for me. On to bees. This past week, my boys participated in the National Geographic Bee, a great activity for these two, the factoid version of hoarders. They really only learned about the competition a few weeks ago, and from what I can tell spent most of their time prepping by memorizing the Yakko’s World song and singing it in slo-mo. For hours on end. But apparently they’ve been actually prepping and got fairly far along in the school-wide competition, with one making it to the final round. Not bad for some fourth-grade first-timers. We had the privilege of watching, and I have to say that if their nerves were half as racked as mine, they didn’t show it. They were poised and present. We were proud parents. They comported themselves with dignity, managed their disappointment, and said their only anger was that they have to wait a year to compete again. And while I was more than expecting that they would go on to another activity, the very next night they were quizzing each other on world geography facts. Talk about a bee in your bonnet! I wish you well and I wish you a dearth of camel crickets. But we do occasionally find ways to spend time together that don’t involve me forcing everyone to do their chores. Because I’ve announced my impending spontaneous combustion if I had to listen to one more kid show, we’ve all bonded over mini-marathons of various Food Network shows. Sometimes it’s Bobby Flay in some competition or another. That’s pretty much what he does. The man has racked up thousands of hours of competition experience. It’s a real edge. I would not. That’s why I’m not an Iron Chef. That and I can’t cook geoduck 10 ways. We noted Flay’s ubiquitous presence on Food Network, his confidence, his ability to truly respect his opponents without knocking them down (unless they trashed talked him excessively, in which case he was more sensei than anything else.) It was fun to see how he put his “spin” on things and how he would take a mistake or a miscalculation and make it work. We turned that into various life lessons, which, as I’m sure you can guess, went over with the kids like a big ol’ plate of geoduck. But some of the Lessons from Food Network stuck – mostly newly acquired vocabulary. My kids now critique their dinners. Terms like “Flavor profile” and “Balance” and “Presentation” and “Not enough acidity” all bandied about over their plates of chicken nuggets. ordered a burger…with a fried egg on top. He wanted to make pot roast. Pot. Roast. He sautéed the carrots and celery and potatoes. He added the tomatoes. We didn’t have a dutch oven, so we used our crock pot. I worried about the timing so I gave it an extra 30 minutes which was, it turns out, was 30 minutes too long. I didn’t say anything about how overdone the center was (I swear to God, I am the only person alive who can overcook something in the crockpot.) However, my husband, i.e., Sir Meats-a-Lot, mentioned gave a nice Ted Talk on the proper cooking time and temperature of all meats ever. To celebrate Son’s first real culinary achievement, he asked if we can eat while watching a movie, so we dined a la tv tray. It’s like the jury panel for Cannes, n’est-ce pas? “You ok?” I asked. That’s my “What’s Wrong” 2.0. The old version too often glitched and got an automated “Nothing” response no matter how often or gently I input it. “Yeah.” He always says yeah. It takes a parent of unusual skill to determine the underlying meaning. In this case, his eye roll, sigh, and angry voice were subtle clues that actually was not ok. I obviously have a participation trophy in parenting. I waited. I’ve learned any noise from me will startle the confession back into its hidey-hole. Sweet boy has been equating cooking, “real” cooking, with panicky, fast-paced, intense, beat-the-clock, chop-til-you-drop movements and unusual ingredients and stress. He wanted to cook until he was exhausted and sweaty, then have us be his panel of judges. I’m putting this here because I did not take a photo of the pot roast, or of us swimming. Or Bobby Flay. I suppose I should call this “food for thought.” No?